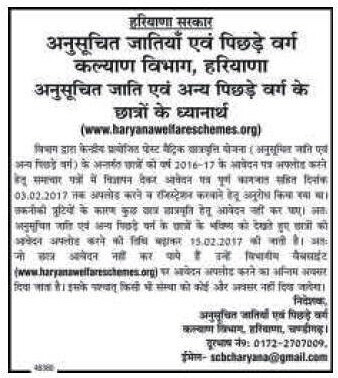 Haryana Post Matric Scholarship for Schedule Caste (SC) and Other Backwards Caste (OBC) the last date for submitting the application form 2016-17 scholarship has been extended to 15 February 2017. Earlier, the last date to submit the application was 8 February 2017 but some students could not register themselves because of some technical problem on the server. Now the ministry has decided to extend the date so all the deserving candidates can submit the application form till 15 February 2017. Now all the eligible students who have not yet applied can apply and avail the facility of scholarship. The candidates can submit the Haryana Post Matric Scholarship Application form online on the official website. Haryana Post Matric Scholarship is for the candidates belongs to SC/OBC caste and studying in post matric classes have an opportunity to avail the facility of Post-matric Scholarship scheme. The candidates must be a domicile of Haryana state and the total income of their parent/guardians must be under 2.50 lakh.The scholarship aims to help the poor SC and OBC class candidates and it will be given for the study of all recognised post-matriculation or post-secondary courses pursued in a recognised institute in India. The candidates can fill the application form only through online mode on the official website of the department. For any query related to this news, write to us in the comment section below.